A waveform is a periodic mathematical function (or sum of functions) defined by frequency, amplitude and phase. 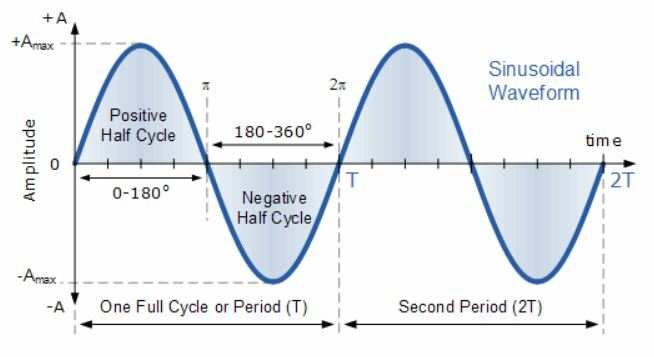 Frequency is the number of full cycles or periods that the waveform goes through in one second. And a harmonic is a waveform with a frequency that is a perfect integer multiple of the frequency of any given fundamental waveform. When the frequency is not an integer multiple of the fundamental frequency, we call it an inharmonic. Harmonics and inharmonics are both grouped into a larger category that we call partials. Partials are all of the simple component waveforms that, when added together, make up a more complex waveform. We call partials that have a frequency greater than the fundamental frequency overtones, and overtones can be harmonic or inharmonic. That’s a lot to grasp at once, so let’s look at an example. Say we have the most basic waveform, the sine wave, as shown in the picture below. Let’s pretend it’s frequency is 100 Hz. The harmonic overtones of this fundamental 1x (100 Hz) waveform are 2x, 3x, 4x, 5x, etc. So the 2x harmonic of 100 Hz has a frequency of 200 Hz, the 3x harmonic of 100 Hz is 300 Hz, and so on. An inharmonic overtone would be a waveform with a frequency greater than the 1x fundamental frequency, but it’s frequency is not an integer multiple of 100 Hz. So an example of inharmonic overtones of 100 Hz would be 122 Hz (1.22x), or 645 Hz (6.45x). One octave is one set of 12 keys from one C note to another C note on a keyboard or piano. If we double the fundamental 1x harmonic, we increase the octave of that tone by 1, and if we halve the fundamental harmonic, we decrease the octave by 1. So, a 2x harmonic is one octave above the fundamental 1x. A 4x harmonic is 2 octaves above the fundamental 1x. An 8x harmonic is 3 octaves above the fundamental 1x, etc. Every doubling or halving increases or decreases by one octave. When we add the harmonics of a fundamental sinusoidal waveform to each other and to the fundamental waveform itself, we can create more complex and interesting waveforms. This is also called additive synthesis, and is the opposite of what the Fourier transform can achieve. Each harmonic can have a different amplitude (level) and phase, and by varying these properties and adding them together, we can create virtually any type of waveform imaginable. Let’s look at a few examples of how we can use sinusoidal harmonics to create different waveforms. A 1x sine wave with no harmonics. In the image above, we have a simple sine wave with no harmonics. This has the fundamental frequency of 1x. The top section is the resulting waveform shape and the columns represent each added harmonic’s level and phase. The far left column is 1x, and as we go from left to right, each consecutive column is the next harmonic in the series. The 1x harmonic is at 100% resulting in a simple sine wave. In the next photo, we can see what the addition of harmonics at varying levels and phases has done to the original waveshape. This is the magic of additive synthesis! Each one of these waveforms is unique and creates a unique sound. The possibilities are limitless here, and more possibilities mean more power to our production capabilities. If you liked this write-up, let me know what else you’d like me to cover in the comments or on the Synaptic Sound Facebook page!